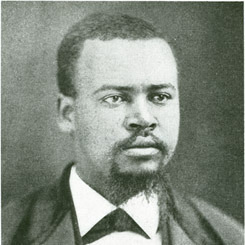 Image courtesy of National Archives Records Administration Born a slave, Representative John Hyman served at the high tide of African-American representation in Congress during the Reconstruction Era, joining six other black men in the House. John Hyman died in his home in Washington, D.C., from a stroke on this date. Emancipated in 1865, Hyman focused on becoming the first black Representative from North Carolina to be elected to the U.S. Congress. In 1874, he realized that dream and won a contested election challenge to the 44th Congress (1875–1877). A quiet man who preferred behind-the-scenes politics, Hyman made no speeches on the House Floor; however, he submitted petitions and legislation on behalf of the poor in his district and state. He sponsored bills authorizing the Treasury Department to build a lighthouse in North Carolina’s Pamlico Sound and to compensate constituents for financial losses during the Civil War. As a result of a Republican Party split in 1876, Hyman lost in the primary to former North Carolina Governor Curtis Brogden. In 1888, Hyman once again sought the Republican nomination to reclaim his seat, but Henry Cheatham defeated his bid.